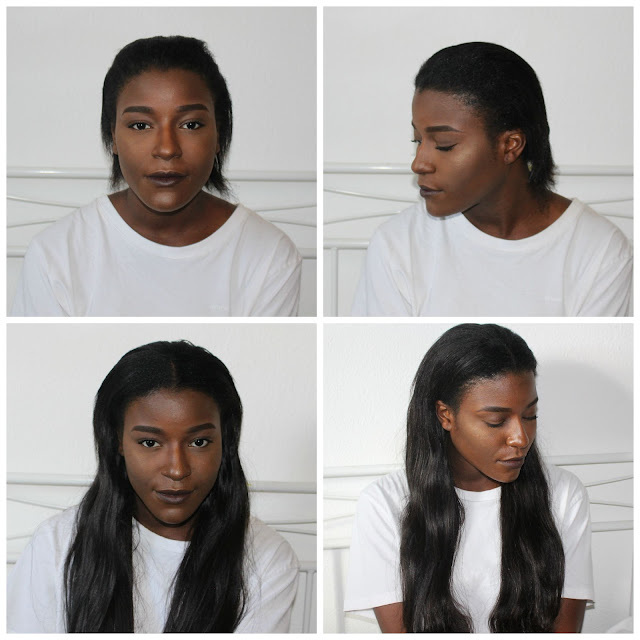 A couple weeks ago I received a lovely package from Irresistible Me the hair extension brand and since I still had my braided hair at that moment of arrival I couldn't try the product earlier. Which was why I was even more excited to try! The package was literally dying in it's corner for like ages. However, one thing that explained my excitement was the fact that I've never tried clip-ins before just the typical sew-in weaves, braids, ponytails and so on. You know the deal my african sisters. So it was pretty much something new to me and just for instance, I always thought (and don't take it offensive or personal ladies) that it was a "white girls thing" but I was totally proven wrong. Those clip-ins are so easy to handle and install to the hair. I even did it myself! It's so much more healthier for your own hair than the sew-ins. They were the once that literally ruined my hair totally to this short mess! Never gonna let nobody to my hair with a needle again! Ohh .. and before I forget - from their very amazing and variable collection I choosed a bundle that came in 200g & 20 inches of the Royal Remy clip-ins in Natural Black which is #1B (click here). And let me tell you something, the hair feels so soft and very natural and matched my own (short) hair perfectly. What do you guys think? .. Note: While this post has been generously sponsored by Irresistible Me, all opinions within this post are exclusively mine.